I am well known for my hoarding skills, just as much as my pin-up poses! Having been an avid carboot sale hunter since the age of 4, I have progressed to antique markets and flea fairs in the vain hope of a bargain. Nowadays carboot sales frustrate me a little. Gone are the days of 20p sales, as antique dealers set up camp next to people clearing their loft of 90’s decor. But do not fret dear Catnips, for there are still bargains to be had and treasures to be found! 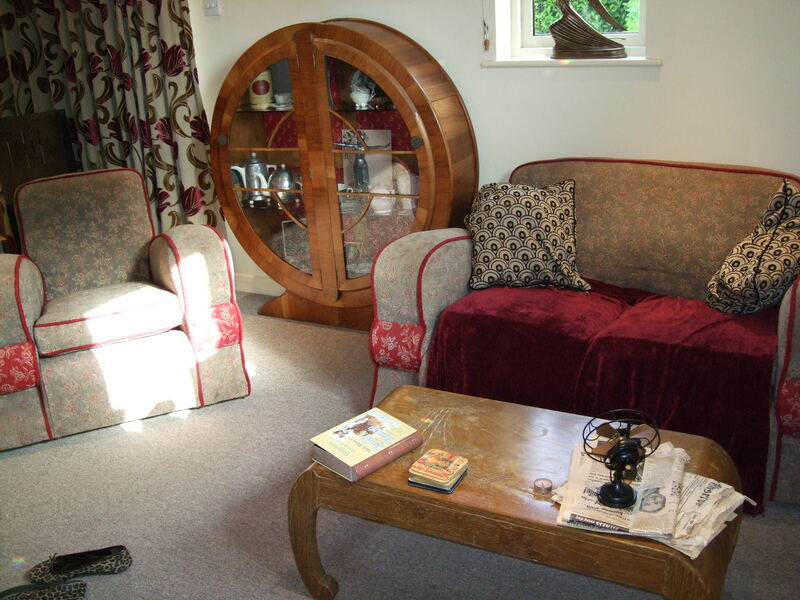 Take my Art Deco sofa set for example, bought for £15 from Ebay and recently valued on the Antique Roadshow at £800. Now that is pretty good going! The first ‘Spinsters Progress’, bought for £1, is well used and first owned by the W.H.Smith & Son’s Library in London. A first edition, this book also has the fabulous ‘BOOK PRODUCTION WAR ECONOMY STANDARD’ logo inside, which is something I always look out for and collect. This mark, found framed by a book and sitting lion is found in one of the front pages of some books printed during WWII in England. Because of paper, glue, thread and ink rationing, books started to be produced meeting certain criteria, much like CC41 clothing. Look out for this mark in your own collections. Usually you can also see what date the book is publiched and which addition it is. Older books will say ‘First Edition … 1942 / First Published’ or ‘Tenth Edition/ Tenth Impression…1949’ etc, whilst post war books may have a line of numbers (something like 6 5 4 3 2 56 57 58 59). The lowest number usually indicates the edition (the example shows that the book is the 6th edition), whilst the larger numbers, if any, indicates the date of print (1956 in the example). This can be handy when looking for collectable first editions such as your children’s Harry Potter books, your Ian Flemming collection and the like. Bear in mind that just because it is a first edition, it doesn’t make it rare or collectible! It’s just a nice thing to look out for when you are at a rummage sale or confronted with a box of old books in your loft. The second hard back book I found was H.M.S. by Klaxon and bought as a gift for Mr. Mew. At a whopping £12, I wouldn’t normally spend extravagances on such an item, but it is rather a lovely book. Dating it is a little confusing as although it states 1918, the first entry was written by Professor J. Scott of a ‘recent Airship Journey accross the old Bed of the North Sea, July 1, 1923.’ A collection of short Naval stories and poems centred around the 1st World War, it is a really interesting read and was definitely worth the money. Reading true and old accounts of the wars is always fascinating. If you are into WWI or the British Navy, this could be a good book for you and can be found online. On to my favourites! Now, any lover of WWII newspaper humour and political comic satire would have heard of Jon’s ‘Two Types’. These two British characters enthralled soldiers and public alike with their rather forthright ‘Damned if we do, damned if we don’t’ manner. These two thoroughly English gents military gents, gave everyone a well needed chuckle in the war years. We happened across a copy of ‘Jon’s Two Types in Italy’, which although slightly dog eared was complete and a bargain at £5. Very collectable, grabbing yourself anything to do with Jon’s Two Types is definitely a worthwhile investment and a great read for the coffee table! Another bargain in my book *titter* was a hardback of ‘New Pocket Cartoons by Osbert Lancaster’ for £3.50. When I initially saw this book, I was convinved that it was a 1970’s publication, with a pale pink and grey illustrated dust jacket over a bright yellow cover! On closer inspection I was pleased that it was infact a 1941 First Edition. A fantastic book, it has reprinted satorical cartoons from the Daily Express, some rather non P.C. for the modern day audience. Books in hand, we made our way to the till, stopping briefly so I could sift through a wad of music sheets! I just LOVE the covers and typography of some of these and managed to grab an original Singing in the Rain, Auf Wiederseh’n Sweetheart and Lay Down Your Arms for 50p each. Bargain! So all in all a successful trip and the kind gentleman of the shop also knocked off another £2, which made the sheet music free. My next stop… a good old table top rummage sale and a flea market, so I will let you know how I get on! Word for the wise, it is a lot more fun going with a set budget and seeing what bargains you can pick up or you may find yourself flittering away that cash before you can blink. Save up your coins and set yourself a limit. With so many carboots and fairs coming up in the summer months, you will need to pace yourself for some good bargain hunting! Never be afraid to offer a slightly lower price, but don’t insult the seller by going rediculously low. They will usually have put up the price of their goods by £1 to £5 depending on what the item is, just incase someone fancies a barter. Happy hunting! Posted in Fashion and Shopping, Home and Leisure, Publicity and Media Announcements and tagged 1940's, 40's, antiques, blogs, books, flea fairs, kitten von mew, reading, shopping, vintage, WW2, WWII, wwii reenactors magazine. Bookmark the permalink.